The majority of existing research on Cuban microenterprise has treated the phenomenon from an economic or political perspective. However, the present paper analyzes this phenomenon from an anthropological point of view, focusing in particular on the transformations that Cuba’s emerging and diverse group of micro-entrepreneurs are experiencing in their work lives. Specifically, significant changes have occurred in how micro-entrepreneurs experience the day-to-day labor process and the meanings these workers give to their labor. These observations are based on an ethnographic case study carried out in Havana between October 2003 and August 2005. The hypothesis is that micro-entrepreneurs (private sector employees and their families) are beginning to redefine their social identities as they approach work with a more instrumental and individualist attitude. As a result, Cuba’s micro-entrepreneurs are a potentially powerful group in the ongoing process of transition currently taking place in Cuba. In short, they could act as a catalyst capable of introducing greater complexity, diversification, and dynamism in Cuban society. 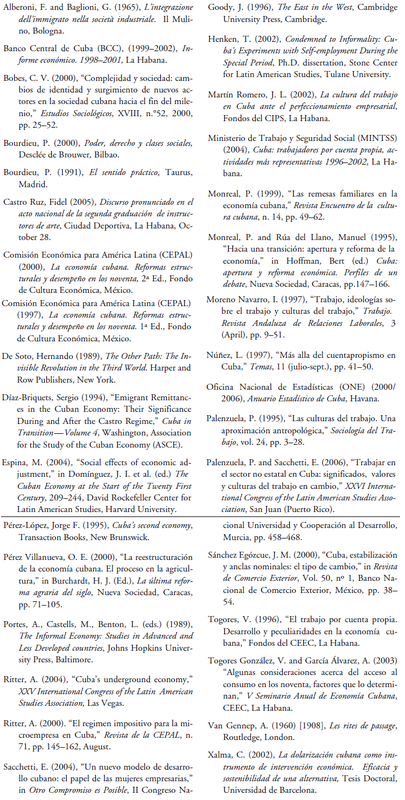 Part of a larger Ph.D. research project in social anthropology, 2 this paper analyzes the formation of a new social group of Cuban micro-entrepreneurs that resulted from the broader process of economic and labor reform enacted in Cuba during the early 1990s. We base our conclusions on an intensive period of anthropological fieldwork in Cuba and focus on several specific ethnographic cases in order to highlight the transformation process that these social actors are undergoing.3 We were especially interested in examining the way these social actors attempt to reintegrate themselves into Cuba’s changing system of production, while they simultaneously transform their “labor cultures”4 and socio-professional identities. Along with gender and ethnicity, professional identity constitutes a structural element of a person’s social identity, such that its modification can result in a more general redefinition of his or her relationship to society.5 This is the process that we trace in contemporary Cuba. The break up of the Soviet Union sent shockwaves throughout the socialist world due to the fact that the socialist world had long functioned based on political and economic interdependency. In the case of Cuba, as this interdependency disintegrated, a deeper economic dependency was revealed sending the island nation into an economic freefall. Until the late 1980s, approximately 80 percent of Cuba’s commercial relations took place with fellow member countries of the Soviet Bloc. As this special relationship came to an end between 1989 and 1993, Cuban exports dropped 47 percent and Soviet subsidies dried up, while international funds from the capitalist world were not yet available. These changes resulted in a drastic reduction in earnings from Cuban exports and a concomitant fall of 70 percent in Cuba’s import capacity (Xalma, 2002). Cuban GDP declined dramatically, falling a total of 35 percent between 1989 and 1993 (Pérez Villanueva, 2000: 74; CEPAL, 2000). This macroeconomic crisis had a direct and immediate impact on Cuban’s living standards, with as much as a 40 percent decrease in personal consumption during these years (Togores and García, 2003). The most visible expression of the crisis among the Cuban population was the generalized practice of “inventing” creative and often illegal subsistence strategies in order to “resolve” daily consumption needs. An explosion of “informal” work of all kinds, the ubiquity of black market transactions, and renewed waves of emigration were perhaps the most prominent and jarring of these many survival strategies. Moreover, the excessive growth of monetary liquidity arising from an imbalance between the money in people’s pockets and the scarcity of available goods drastically reduced the purchasing power of the Cuban peso leading to a devaluation of real salaries. Once Cuba legalized the circulation and use of the US dollar, the informal exchange rate of Cuban peso against the dollar, which had hovered around 1:5 in 1989, rapidly rose, reaching 1:45 by 1992, finally stabilizing at 1:130 by 1994 (CEPAL, 1997; Sánchez Egózcue, 2000). At the same time, Cuba’s average monthly salary stagnated at just 185 pesos (ONE, 2001; BCC 2001). The combination of the drastic depreciation of the national currency and the stagnation of salaries contributed to a general devaluation of labor as a means to achieve subsistence (Togores and García, 2003). Thus, during the early 1990s, the majority of the population was forced to disengage from their formal state jobs in the official economy and survive by deepening their connections with the underground economy and/or resuming links with relatives who had emigrated in hopes of receiving remittances.6 We can then recognize a two-headed society, where behind the official mask of the “revolutionary” collective, individuals who identified with and were publicly committed to the principles of the socialist system were engaged in a daily struggle for survival in activities that often violated the spirit of these principles. These activities often included the illegal resale of rationed products and the theft of public goods from state warehouses for resale at a personal profit. During this juncture, manifold new behaviors and feelings began to break out among the populace including resistance to a situation of national crisis, loss of motivation for work in a job paid with a increasingly worthless salary, frustration and weariness over dashed expectations of a better life (postponed for three decades and then vanished under the ruins of the Berlin wall), a boom in underground economic activity, and a clear capacity for developing informal survival strategies. As Cubans grew increasingly desperate to eek out a living, they reached the ethical limits of obedience to unenforceable laws and adherence to principles that were quickly becoming obsolete. Given such a stark situation, Cubans of all stripes could easily justify their “criminal” activities with reference to the economic crisis. At the same time, Cubans began laying the groundwork for a new hybrid form of social ethics. In the words of French sociologist Pierre Bourdieu (1991: 92–93), Cubans were developing a new “habitus,” that is a “system of long-lasting and transferable dispositions” that included new “system of cognitive and motivational structures.” Knowledge about and placement within social networks in a highly informal environment suddenly became a valuable commodity that increased the importance of family and friendship bonds, other relationships based on mutual support and complicity, as well as the practice of reciprocal solidarity. Much like what had occurred in other formerly socialist countries, the “second economy” 7 in Cuba grew in importance and became an essential complement to the much weakened formal sector. Facing a potentially dangerous and chaotic social crisis, starting in 1993 the Cuban government was forced to revise its own strategies and enact a series of structural (though limited and selective) economic reforms (Monreal and Rúa del Llano, 1995). Thus, in search of a development model that could function in this drastically changed socioeconomic domestic and international context, the Cuban government left behind the 1990s and headed into a new century with a significantly transformed social and economic structure. In anthropological terms, this critical stage of the Cuban Revolution can be considered a “liminal” (Van Gennep, 1960 ) time in its historical development: an exceptional period of social transformations. The official name of the era itself, “the special period in time of peace,” indicates its “limited” or “special” character. Like any phase within a transition, the special period has been characterized by risk and uncertainty and was preceded by an epoch-ending break from a previous economic model. All this happened under the guide of the generally hallowed authority, the socialist State, and in the frame of a sacred periodization (from the “Rectification of Errors and Negative Tendencies” to the “Special Period”). The first painful decision taken was to open the country to the circulation of dollars, rapidly impacting the expectations of many Cubans. “Self-employment” (known in Cuba as “trabajo por cuenta propia”) was subsequently legalized in August 1993 and formally regulated under Decree Law #141. Essentially, the degree was a stop-gap measure intended as a method of containing the rising level of unemployment and giving a legal outlet for Cubans to find their own individual or family solutions to the problem of basic needs. This restructuring process is soon extended to rural areas, where more leeway was given to private farming and a new kind of agricultural cooperative was created (known as UBPCs, or Basic Units of Cooperative Production) in September 1993 under Decree Law #142. Finally, two years later in 1995, deeper reform was enacted though a new foreign investment law which offered better and more attractive conditions to foreign capital as compared to the past. As a result of all these macroeconomic reforms and adjustments, a new kind of labor environment began to appear that was previously all but absent. Concomitantly, new social subjects arose within these new private labor arrangements (micro-entrepreneurs, private wageworkers, employment in foreign companies and in cooperatives, etc. ), whose presence had been eliminated or existed underground for more than thirty years. This process of economic restructuring was quickly embraced by the majority of the population, leading to the fragmentation of the supposed homogeneity of the revolutionary civilizing model that had been in place up to that point. These new labor arrangements and identities then led to a progressive differentiation and complexity in Cuba’s socioeconomic structure (Bobes, 2000; Espina, 2004). In self-employment, the cradle of the microenterprise, one can find perhaps the clearest and most pronounced expression of this newfound socioeconomic complexity. Such behaviors locate these activities, however legalized and acknowledged, in the realm of the “second economy.” In the context of a strongly centralizing and markedly socialist state, the “second economy” can be defined as the economic space that includes both irregular activities and those perceived by the authorities as an ideologically illegitimate challenge to its monopoly and in opposition to the ideal of state ownership, public employment, and centralized planning and redistribution (Henken, 2002). This antagonistic relationship between inventive and often evasive cuentapropista (the self-employed) and the government authorities who constantly seek to control private activities results from the fact that Cuban workers are subject to state rules and regulations, which in practice are nearly always decisions unilateral and indisputable. Such a structural context make it easier to understand why so many Cubans have opted for engagement in irregular “second economy” activities, producing a peculiar pattern of burgeoning growth followed by rapid decline since self-employment was first legalized in 1993. While notable discrepancies in official data (see Tables 1 and 2) make it impossible to trace a definitive trend, the decrease in the number of licensed micro-entrepreneurs is clearly evident, especially after 2000. After the first few years of legalization (1993–1995), the size of the private sector has been constantly decreasing, reaching just 3.6 percent of total employment in 2004 (166,700 persons) (ONE, 2006). To get a more accurate gauge of the actual number of individuals engaging in micro-enterprise, however, we would have to triple this number,10 considering the much larger informal (unregistered or unlicensed) labor force in the country. This group shows a specific socio-structural configuration, with peculiar characteristics in gender, race, socioeconomic status, and geographical location. 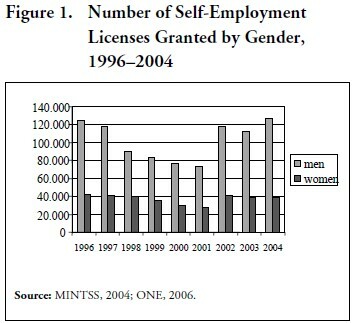 The percentage of licenses granted to men and women between 1996 and 2004 fluctuated between 69.3 and 74.9 percent for men and between 25.8 and 23.7 percent for women (see Figure 1) (MINTSS, 2004; ONE, 2006). There are no published statistics about the racial composition of this sector, nonetheless fieldwork indicates that there is a severe under-representation of Afro-Cubans among the registered self-employed. An explanation for this may come from their history of marginalization, especially in terms of infrastructural resources. For example, Afro-Cubans continue to be under-represented in the neighborhoods that are home to the most lucrative self-employed occupations, such as paladares, cafeterias, and bed and breakfasts, and tend to have low levels of economic resources relative to whites. Thus, as a group, Afro- Cubans have difficulty in gathering the start-up capital necessary to launch entrepreneurial activities and often lack an adequate place in which to exercise it. 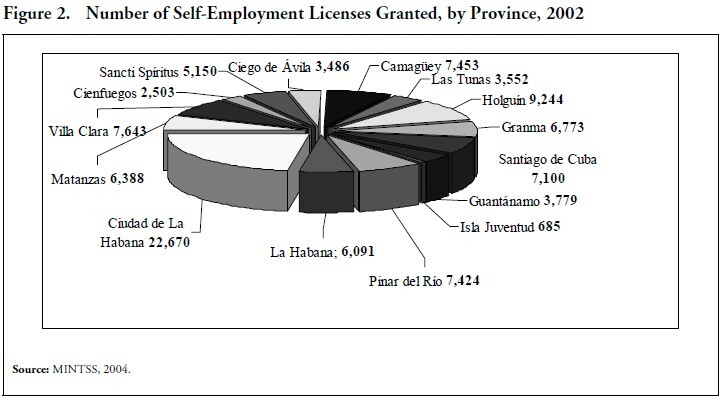 Finally, the available data on the geographic dispersion of registered micro-entrepreneurs in 2002 (Figure 2) shows that the capital city, Havana, easily predominates with 22,670 licenses, a number close to the next three provinces combined (Holguín with 9,244, Santiago de Cuba with 7,100, and Matanzas with 6,388) (MINTSS, 2004). In summary, it appears that white males from Havana tend to occupy a leading position among Cuba’s micro-entrepreneurs today. In choosing which micro-enterprise operations to investigate, we attempted to balance two main criteria. First, we wanted to differentiate peso operations from other businesses that use divisas—once the US dollar but now exclusively the convertible peso (CUC, known popularly as the chavito). We also wanted to differentiate between the quantitative and qualitative relevance of different activities. That is, we wanted to focus most of our attention on those activities that directly impact the daily life of the Cuban population (whether they are among the most numerically representative or not), while at the same time recognizing those operations that intersect with the tourism industry, perhaps the most dynamic economic activity in the national economy. The activities which have obtained the highest number of licenses are found in the area of transportation (mainly taxis colectivos), which accounts for 22.6 percent of all self-employment licenses. Food service follows close behind transportation. When grouped together with the related license for “family support,” food service amounts to 19.4 percent of all licenses (this includes the many small street-side cafeterias as well as Cuba’s famous paladares). The third most important self-employment activity is the renting of rooms in private homes (aka, bed and breakfasts), which account for 9.7 percent of all licenses (MINTSS, 2004). While we decided not to include private transportation as part of our study, we did emphasize both food service and bed and breakfasts. In the former category, we focused especially on the cafeterias/pizzerias that operate in Cuban pesos and the dwindling number of paladares that operate in convertible currency (CUCs).11 We included private rentals due to their clear numerical presence, their deep integration in the tourism industry, and their degree of specialization in terms of types of services offered to customers. We also included in our study a number of varied arts and crafts activities that have become a visible part of the economic fabric of Cuba over the past 15 years (cobblers, sculptors, painters, ceramicists, etc.). Finally, the variables that we considered in defining our sample were the owner’s gender, location in the Havana urban area,12 the model of organization (single- family, company, etc. ), the size of the enterprise, and the type of customers typically served. In addition to engaging in participant observation within the micro-enterprise sector as a whole, we conducted 86 semi-structured interviews directly with cuentapropistas themselves. In these interviews (all of which were digitally recorded), we focused on micro-enterprise management, labor relations and organization, decision-making processes, and responsibility sharing, as well as trying to trace the working history of the protagonists with an eye to their experiences transitioning from previous employment with the state into this new, more independent sector. In this comparison, we were particularly interested in material differences, changes in the meaning of labor, and the impacts on the lives of our subjects beyond their working lives. That is, we wanted to see how the experience of independent work affected their consumption habits, daily activities, identities, and general outlook. The universe of private workers is characterized by a marked heterogeneity in socio-professional position and in previous working experiences. It is particularly common to find highly skilled and educated professionals reinventing themselves in occupations for which it would seem they are overqualified. For example, our sample includes a philosopher, a biologist, a sociologist, a micro-palaeontologist, a pedagogue, an agronomist, a pilot, an engineer, a secretary, a physician, and various economists, among others. These individuals have taken on jobs as chefs, taxi drivers, painters, and hosts to foreign tourists in their homes. They are undergoing a learning process and widening their technical knowledge based on their particular job and abilities as managers. There are also other factors which balance these elements of difference, constituting important common features that explain the reason for the formation and consolidation of self-sufficiency and microenterprise management, facilitating the permanence of these individuals in the private sector. The first notable characteristic is the relatively advanced age of these entrepreneurs, falling on average between 50 and 60 years-old.13 They also often have had long careers working in the state sector. This means that they are often leaving behind years of work experience under the model of a centrally-organized, state-planned and -directed system with low levels of autonomy, and entering a new work world. State jobs in a socialist system are charged with meanings that often go beyond the labor process itself, permeating other dimensions of one’s existence. For example, state-sector jobs in Cuba often require attendance at political and ideological gatherings, official union meetings, special rotating night shifts, and periodic “volunteer” activities beyond the scope of normal work duties. Moreover, these specialized activities connected to one’s state sector job can take up a significant part of one’s spare time and can include entertainment, group excursions, incentive-holidays, and group birthday celebrations, organized by the company itself. Thus, working for the state in Cuba has not traditionally been understood as an activity limited to one’s work life. Instead, it often develops into an identity that permeates all aspects of one’s public persona and acts as a general force for the homogenization of labor experiences on the island. The all-pervasive nature of many of these state jobs has allowed the state to exercise a great degree of control over workers’ time (both work and spare time) and over their consumption capabilities through salary and rationing, impacting both the material and ideal spheres of workers’ lives. In this context, a job which allows workers to free themselves from state employment not only affords them the increased opportunity to live better materially in a time of generalized economic crisis. Private sector jobs also short circuit the social control mechanism of absolute state employment preventing the state from diffusing its ideological principles and allowing the self-employed to develop and independent ideology based on personal or family interests (Palenzuela and Sacchetti, 2006). El cambio lo siento en sentido favorable: el cambio económico me ha dado libertad. El que es independiente económicamente es independiente políticamente. La esencia de lo que pasa en este país es ésta, por eso no se le da apertura a la iniciativa privada o a la propiedad privada. In an historical time that we have defined as “liminal,” such individuals have been able to react in a creative way to the crisis, breaking their bonds with the previous work model and showing their independence, innovativeness, and ability to adapt to a new socioeconomic context. All these are extraordinary qualities and they help us explain the results these people acquired for themselves in the new mixed model of the national economy. Another common aspect, found most of all among micro-entrepreneurs working in private restaurants and room rentals, is the exploitation at the beginning of their activity of an advantageous position compared to the rest of the population. In other words, the leaders in these sectors of self-employment took advantage of their endowments in terms of economic resources, technical knowledge of the job, the dynamics in the growing tourism sector, and access to a large and well-kept house suitable for renting rooms. Many of these operators also proved to be adept at managing a network of contacts in the all-important institutional and bureaucratic spheres allowing them to simplify potential bureaucratic obstacles. This is the case of two founders of paladar P1, who had previously worked in food service for the diplomatic corps. This previous experience allowed them to bring along a solid foundation of technical knowledge, as well as utilize key diplomatic relationships to their advantage. A similar case is that of BB1, whose once-middle class operators have been able to preserve their well-appointed and centrally located building, turning it into a business. Furthermore, they actively utilized the language skills of one of the co-founders (a professional interpreter) in order to attract high-end tourists into their home. This system of relationships weaves micro-entrepreneurs into a web of reciprocities together with the members of their closest social circle: relatives not working in the activity, neighbors, local CDRs, colleagues from other micro-enterprises, and the representatives of state control organizations. On the one hand, we witness the symbolic redistribution processes of benefits, from the micro-entrepreneurs to the nearest social groups, in the form of anonymous donations, subventions, and contributions to common activities (for example, the annual CDR party), having a clearly compensational purpose against the growth of socioeconomic stratification based on income. Through these strategies, micro- entrepreneurs try to minimize social disparities and prevent potential conflicts caused by the fracture in the supposedly homogeneous social order. On the other hand, the generalized perception among microentrepreneurs of state hostility16 stimulates the diffusion of a group identity as a threatened group. This negative solidarity together with the absence of specific institutional structures for the protection of private work fosters the formation of co-operation bonds among workers from the same activity. Likewise, artisans from similar activities coordinate strategies of co-operation, enabling them to elude the rules that require that a single person be both the producer and seller of his products at the street markets. The formalized figure of the “producer-vendor” artisan is actually split in two: the (properly called) artisan produces while the vendor (with his specific license) markets the goods of the former on the street, and the revenue is shared according to their agreement. A further facet of the reciprocity apparatus emerges, this time between micro-entrepreneurs and government inspectors (coming from the Departments of Labor, Finance and Prices, and Public Health). Various kinds of gifts or forms of bribery are offered or demanded during inspections, all along the institutional and bureaucratic chain, in order to conceal the many irregularities. Iniciativa, creatividad, disciplina, hay que tener puntualidad, cumplir la norma de trabajo. […] Cuando hay un incumplimiento de manera irresponsable, como decimos nosotros los cubanos “nos embarcan en el trabajo,” queda fuera, y se lo decimos del primer momento. […] Tratamos de simplificar y hacer eficiente a cada hombre que tenemos aquí, porque en definitiva aumentar los costos no es nuestra política, porque tenemos menos ganancia. […] cuando hay mucha gente y cada cual no tiene dosificado su tiempo lo que hace es estorbar. The labor relations established between the microentrepreneur and his employees are then outlined by a marked asymmetry, which takes shape in the strongly hierarchical structure of these micro-enterprises. A high grade of precariousness affects them: the latter are acknowledged as “family support” and therefore not considered private workers, but when they operate outside of these parameters, they become “clandestine” and prosecutable by the law. The uncertainty surrounding these work options and the high level of informality which permeates labor relations from the inside, reinforces the role of personal relations between the owners and their employees, and the establishment of bonds of identification and belonging among the former. Mechanisms of reciprocity underlie these labor relations and act as a guarantee for the agreement that regulates them: the owner’s trust in his employees— who handle the money and have a perfect knowledge of his financial resources and of the committed irregularities—is balanced by their loyalty, attracted by higher incomes and better work conditions that are in general associated with a private job.17 In spite of the lack of guarantees in private work, the possibility of a higher income in the new activity minimizes the importance of variables like job security, protection from abuse and exploitation, and work stability. For most workers who do not have the luxury of planning for the future, immediate material advantage is more important than being in a stable occupation. We argue that many of these irregular elements of self-employment could be neutralized through the modification of some of the current regulations on private work. The contributions micro-entrepreneurs make to the economy should be acknowledged, allowing them to hire salaried employees and further expand their business volume. We agree with the conclusions of economist Archibald Ritter (2004) about this, in his careful analysis of the origins of the Cuban underground economy and of the progressive sliding of micro-entrepreneurs towards informality: a liberalization in the granting of new licenses, the application of a more measured and progressive fiscal policy, and the establishment of adequate supply networks so entrepreneurs will not be tempted to buy stolen goods from the black market. These changes would allow for more business regularity and transparency, as well as creating a climate of generalized legality in place on the current one of widespread illegality. Currently, however, the prospects for the future seem not to head in this direction. After the devaluation suffered by work as a consequence of the decline of real value of salaries in a time of crisis,19 workers in this economic sector began to re-evaluate its centrality as a means to achieving certain rewards, both material (greater economic power) and ideational (as an element of self-achievement). The success of the activity one has created individually becomes one’s main concern over and above a labor process externally controlled by the state. The ambitions of the greater part of these entrepreneurs are turned to an increased autonomy, to the achievement of a more flexible freedom of action, and to a professionalization of the work group. However, such workers quickly collide with the strict restrictions imposed by the state on free economic development. The consequences of this impact converge into a feeling of personal dissatisfaction that, hidden behind financial benefits that characterize the new activity, crops up on the plane of expectations and prospects for the future. Mis expectativas están directamente relacionadas con la sociedad en que yo vivo, es decir, yo puedo tener muchas expectativas pero tengo que ver si la realidad me va a permitir desarrollar mis expectativas, que es ampliar mi negocio, tener más. Claro, todo el que tiene un negocio le gusta que su negocio prospere, pero después de que prospera ¿qué hace? Ampliarme. Esto es lo que me gustaría, teniendo en cuenta que esto es lo que es, pero puede ser que, no sé, dentro de dos años dejen la oportunidad de abrir cualquier otro negocio y yo pueda tener otra cosa. The absence of real commercial competition due to the lack of a competitive state supply and the modest size of the private sector, together with the persistent use of a system of gratuities and subsidies offered by the socialist state to the totality of its citizens, provides assurance of income and of a certain economic success. However, the absence of competition is just one of the elements that differentiate the situation of Cuban micro-entrepreneurs from their informal cousins in the rest of the Hemisphere. They have not been educated inside a market economic context, where it is necessary to develop technical abilities and marketing skills. The only great risk they face day after day in the management of their activity is the arbitrariness of the state and its freedom to apply sudden changes to regulations. The institutional limitations prevent them from starting innovative projects and slow down the development of those acknowledged as typical and distinct features of capitalist attitudes: inclination to risk, mobility, search for new markets, will to gather and reinvest, etc. (Goody, 1996). The figure of the Cuban micro-entrepreneur, shaped as the result of a gradual transformation process in the sphere of technical knowledge and ideological aspects related to work since 1993, constitutes a sui generis character who, while keeping a distance from his capitalist cousins, also differs from the members of other socio-professional groups inside Cuban society itself. That is, while Cuban micro-entrepreneurs are no longer socialists, neither are they yet full capitalists. They admit that they have experienced a big turn from the situation they were in personally before starting their new activity. However, the majority of the population remains directly connected to the state economy as employees, even if they occasionally moonlight in the black market. A veces es difícil porque siempre a nosotros nos ven como burgueses, como los ricos, o que sé yo. […] A veces a la hora de tomar decisiones son muy ásperos con nosotros: “Esto no se puede hacer, esto es capitalismo,” es como dicen. Antes recuerdo que la gente que tenía más solvencia, yo la veía un poco más distante de mí, me trataban diferente, no podía compartir con ellos los mismos espacios. No siempre podía comprarme una cerveza ¿no? [Eran] gente que tenía la posibilidad de hacer una fiesta y comprar ron de no sé cuanto dinero, tomar cerveza, y vestirse a la última moda. Siento que ahora, después de todo esto, yo puedo ir a los mismos lugares, puedo tomarme una cerveza, invitar un amigo a comer, y ya no quedo tan diferente. […] pero al final me he dado cuenta de que hay gente que ahora está por debajo de mi, que me miran como […] El otro día me dijo una amiga mía: “No, pero a ti se te ve el dinero,” y yo me quedé así, recordándome de como yo miraba a las personas que tenían dinero y que tenían más posibilidades. Entonces así me estará mirando la amiga mía ahora. As these Cuban workers abandon state employment and begin to experience work in the private sector as entrepreneurs, they adopt more individualistic and instrumentalist approaches to their work lives and new understandings of the meaning of work itself. Their change in economic status and their higher purchasing power induces micro-entrepreneurs and their families to modify some of their daily habits and consumption standards. Regarding their diet, an element of primary importance in the family economy, products received at state-regulated prices through rationing and those bought in Cuban peso areas are replaced with others purchased in CUC (convertible peso) shops. The quality of their houses improves, with the building of additions, renovations, or the acquisition of the most advanced comforts available. They opt to buy their clothes in shops where the most exclusive brands are sold and engage in forms of investment that involve the purchase of permitted goods not subject to devaluation, like gold jewelry. Spaces of socialization also change, and spare time options increase: options available to the majority of Cubans— theatres, cinemas, walking in the “Malecón”—are joined by visits to gyms, cabarets, discos, and clubs normally visited exclusively by foreign customers. There may be changes also in friendships, with the inclusion of individuals who share the entrepreneur’s higher standard of living. Old elements and practices are seen by our informants as part of a sad and undesirable past, abandoned with the advancement to a new form of employment. At the same time, we witness a transformation at the individual level, where these social actors now talk of having the power of “choice” and the desire for differentiation, something once condemned as contributing to inequality but now embraced as a personal right. Along with the recent development of Cuban microenterprise have emerged new cultural expressions, starting from the experience of change in the individuals’ work lives. As a result, a process of personal transformation begins to take place evidenced by the development of new daily practices, a new worldview, and the progressive acquisition of an individualist conscience. Moreover, a new socioeconomic identity has emerged in Cuba where self-employed micro-entrepreneurs have begun to think of themselves (and are thought of by others) as members of a differentiated social group. However, we still must address the difficult question of the role that this group will be able to play in the future. We have defined these individuals as exceptions in the Cuban context, since they have a stock of personal resources which has allowed them to (a) develop success strategies of adaptation to a new situation and (b) succeed in disengaging from the constraints of state employment and the specific way of life that comes with it. About this we want to apply, re-interpreting it, a concept developed several years ago and used in a different context22 by two Italian sociologists: “anticipatory socialization” (Alberoni and Baglioni, 1965). We indicate through it the condition of some individuals who acquire the goals of a society they consider more advanced than their own, not belonging to it but still striving for it; this way they end up being “socialized in advance” to the new society. In the case of the emerging Cuban micro-entrepreneurs, they seem to be experiencing “anticipatory socialization” as they acquire the values, behaviors, and ambitions more typical of individuals in market economies. At present, it is difficult and hazardous to produce a forecast for the future of this social group, relatively heterogeneous, in an uncertain and ever changing context such as the Cuban one. In spite of this, and thus we try to answer our question, we see in these micro-entrepreneurs—who have reached a fair level of autonomy—good management skills and a developed entrepreneurial spirit, a growing force for change in the country’s ongoing political and economic transition. 1. Editor’s Note: This paper was awarded First Honors in the ASCE Student Prize Competition for 2006 for graduate students. It was translated from Spanish by Ted Henken with assistance from the author. 2. This research project was made possible by a Ph.D. scholarship grant from the Spanish Ministry of Education and Culture (2002– 2006). 3. The research on which this paper is based was done in Cuba over a period of 17 months (October-December 2002, July-December 2003 and 2004, and July-August 2005). It was done in collaboration with several research centers at the University of Havana and the Cuban Ministry of Science and Technology. We made particular use of participant observation and conducted in-depth interviews with 79 individuals. Among those we interviewed are 39 micro-entrepreneurs, a number of inspectors from the Ministry of Labor, as well as Cuba’s leading economists, demographers, and sociologists who specialize in the study of socioeconomic change in Cuba. Finally, we gathered all available legal, historical, statistical, and demographic data. 5. I employ the theoretical frame of the “Matriz Estructural Identitaria” (structural identity matrix) as defined by GEISA (Grupo para el Estudio de las Identidades Sociales en Andalucía), a research group of the Department of Social Anthropology of the University of Seville, to which I belong (Moreno Navarro, 1997). 6. It has been estimated that between 1989 and 1994, the yearly transfer in remittances ranged from $300 to $400 million (Díaz-Briquets, 1994). Data from 1996 balance of payments related to total net transfers—remittances constituting a significant part of them— report a value of $743.7 million. Cuban Economist Pedro Monreal (1999: 50) estimates that $500 million of this total were remittances. Between 1992 and 1996, the yearly average increase in such transfers between was 242 percent. In 1996, CEPAL estimated remittances at $800 million, while other Cuban estimates are lower, ranging from $300 to $400 million (Ibid.). 7. This sector, also called “irregular,” “informal,” or “hidden,” was defined by Alejandro Portes and his colleagues as the area of activity not institutionally regulated, in a social and legal context where similar activities are (Portes, Castells, Benton, 1989: 14). It assumes different shapes, characteristics and functions through capitalist economies and centrally planned economies. In the first case the informal economy is seen as the result of the inability of the capital to absorb the exceeding labor force, the antagonism between enterprises and the government (De Soto, 1989), or the class struggle between labor and capital, which takes advantage of informal work eluding law regulations (Portes et. al., 1989). On the other hand, studies of the second economy in socialist countries have explained it as a complement to the official economy and, at times, an element of social stability. The Cuban case is better explained by this second group (Henken, 2002; Pérez-López, 1995). 8. Given the limited scope of this article, we do not analyze regulations or the tax system. For deeper insight into these subjects, we refer the reader to the careful work of Canadian economist Archibald Ritter (2000; 2004). 9. Examples include rules against the hiring of any employees beyond “family helpers” (although fictitious relationships are often artificially created through ad hoc weddings or living arrangements), restrictions against any more than “doce sillas” (twelve chairs) in private restaurants (“hidden” rooms are often added out of sight), and cafeterias are required to produce all their foods themselves (even though they often enlist suppliers through a network of specialized bakers and cooks). 10. In addition to our personal observations during almost two years of fieldwork, we also rely on the estimates of a number of Cuban researchers. For example, Viviana Togores estimates that for each license issued, three unlicensed jobs connected to it appear. The multiplier effect of self-employment is even greater when we consider the impact of the supply chain (Togores, 1996). 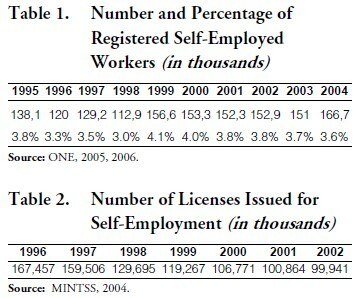 Likewise, Núñez estimates an average of 3.5 workers per single license (Nuñez, 1997). We must also consider those who are engaged in self-employment without a license. 11. While official data on Cuba’s paladares is scarce, Ted Henken (2002) indicates that there has been a precipitous drop in the number of registered paladares in Havana. We tend to agree with his estimation of this trend and estimate that there were fewer than 70 remaining paladares in the City of Havana by 2005. 12. We chose Havana city as the geographical frame of our investigation, since it is the most dynamic area of the country, where changes happen at the highest rate and ahead of other areas, and because it is the place where private work is most developed. 13. “Family helper” employees are often younger (members of the family or not), as are partners, when they are not the owner’s children (which is common). 14. In order to protect anonymity, all references to interviewees will use pseudonyms. The same goes for micro-enterprises, which will be identified by acronyms: “P” for paladares (P1–P8), “CF” for cafeterias (CF1–CF12), “BB” for bed and breakfasts (BB1–BB11), and “ART” for crafts workshops (ART1–ART8). 15. We prefer to transcribe these interview excerpts in their original language in order to more accurately capture the original expressions and nuances of our informants. 16. The government’s antagonistic attitude towards micro-enterprise has been expressed on a number of recent occasions in speeches by President Fidel Castro. For example, on October 28, 2005, Castro explicitly referred to the self-employed as the “new rich” (Castro, 2005). 17. The distribution of benefits follows hierarchical criteria. Even when a “common fund” is declared, it is reserved for employees who are close blood relatives of the owner (children, spouse, etc.). The income difference between micro-entrepreneurs and their employees is often pronounced. In the more extreme cases, we estimate that it can reach a 10:1 ratio. 18. We were able to verify that in the majority of cases, when women hold the ownership licenses and actively manage the private activity, they acquire a position of power that is reflected from the labor sphere into the domestic sphere. This, defined in social sciences as a process of “feminine empowerment,” is particularly visible in the attainment of a central role in decision-making processes, as well as in money management (Sacchetti, 2004) both in the micro-enterprise and at home. 19. A reversal of this took place in 2005, when the State Committee approved a resolution (Medidas sobre las tarifas eléctricas, incrementos salariales y de la Seguridad y la Asistencia Social, 22/11/2005) which revised the salary system. 20. Manager of P8, male, 37 years old, university educated. 21. Owner of CF2, retired, with a long experience in active politics, in both the Communist Party and the CDRs. 22. The concept was born in the study of immigrant integration into Italian industrial society of the 1960s.